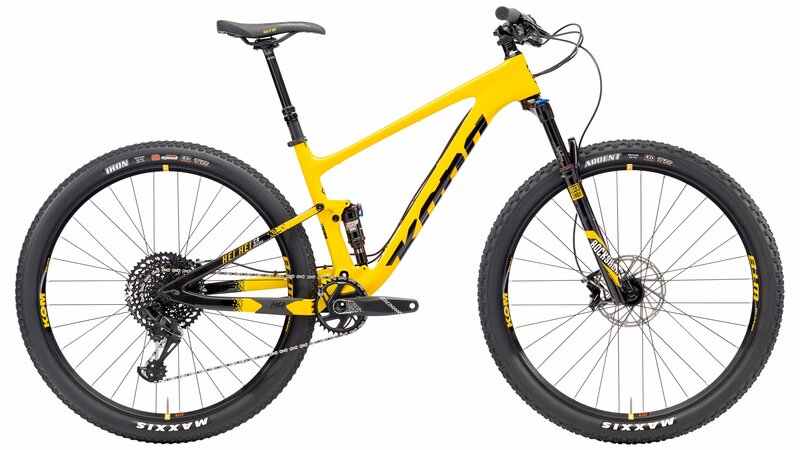 With the Kona Hei Hei, You get all the speed and climbing prowess you would expect from a XC bike, but when it’s time to point this bike downhill, you'll realize it'so much more. The Kona Race Light Carbon is lightweight, but strong as all get out. You will never feel like you need to tip toe around while you’re riding the Hei Hei. The Kona Fuse suspension platform with RockShox Monarch rear shock provides efficient pedaling while remaining plush through the chatter, and then really starts to shine as the bumps get bigger. The 120mm RockShox Reba up front will smooth out the roots, and gobble up gnarly rock gardens. With the wide range of gearing that SRAM GX Eagle provides, you'll find yourself enjoying the benefits a 1x drivetrain more than ever. 29” wheels are big enough to supply that roll over anything feeling while remaining nimble through tight switchbacks and technical sections. Keeping it all under control are the SRAM Guide brakes. The Hei Hei trail is an unrelenting pursuit to push the limits of what a bike can do. It is perfect for the endurance racer, weekend warrior, or experienced trail rider that wants a fast, go anywhere trail crushing machine that will turn your rides up to 11. 152-166 cm 5'5" - 5'10"
166-178 cm 5'9" - 6'2"
Have ridden this bike on various trails in the Grand Junction, Moab, and Hurricane areas. Love the way it handles. A little light on the suspension, but has not been a problem yet. BEST ANSWER: 28.5, could shave later with upgraded wheelset. I use it as a XC race bike, but I can take it to a place with chunk and drops. It can party. What travel does the reverb have if you buy the xl size bike, and what length are the cranks? Thank you! BEST ANSWER: 100 mm travel, 175 on the cranks, great build for the price.